Ducati, the well known Italian motorcycle brand, is reportedly going up for sale. It has been reported that several companies that are looking into acquiring the Italian motorcycle brand include Volkswagen and Mercedes-Benz AMG division. Investindustrial Holdings, a private equity firm, currently owns Duacti. Reuters reports that the firm's CEO, Andrea Bonomi, has indicated he is no longer interested in having Ducati under the firm's control. Investindustrial and Bonomi want to cash in and make a little green on this investment. What is the asking price for Ducati? A cool $1 billion Euros, which is nearly $1.32 billion US dollars. Even with what some seem to believe is a high asking price, there are several interested parties that would like to buy Ducati. AMG, Mercedes-Benz performance division, has reportedly shown interest in the Italian motorcycle brand and so has Volkswagen. Volkswagen Chairman, Ferdinand Piech, apparently regrets not buying Ducati when it could have been purchased for very little. He owns many Ducati motorcycles, which might be one of the reasons the company has shown interest. It is not clear how the motorcycle brand would fit into VW's portfolio and what they would plan to do with the company. 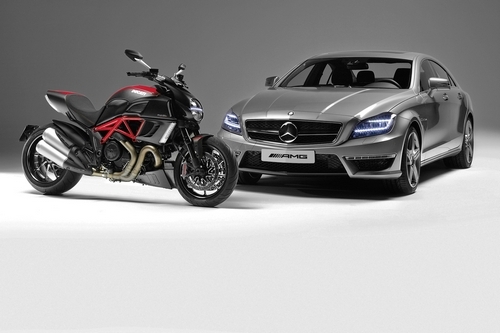 Mercedes-Benz’s performance division has teamed up with the Italian motorcycle manufacturer before. They collaborated on creating the Ducati Diavel AMG Special Edition motorcycle which was displayed at the 2011 Frankfurt Motor Show. The marriage of these two performance orientated companies might be ideal, but who knows what will happen. Car companies are not only looking into Ducati, but motorcycle makers too. Reports suggest that BMW's motorcycle arm is looking into acquiring the brand, though the company claims that it is not interested in buying Ducati at this point in time. Mahindra & Mahindra's motorcycle group is another company that could buy up the Italian marquee. This asking price of $1.3 billion US dollars by Investindustrial Holdings is roughly three times more than what the private equity firm initially invested in Ducati. Whether they will get their asking price is yet to be seen. With so many reportedly interested companies that would like to acquire the Italian motorcycle manufacturer it seems like a bidding war might ensue. Ducati has 10.7% share of the global motorcycle market. So if you are an automaker looking to break into selling motorcycles, this is a great opportunity. However, the motorcycle market is a much smaller than the automotive market, and does not sell nearly as many units. The automotive companies would be wise to consider this when purchasing Ducati. If ever there was a killer brand to acquire, this is it. I agree, but I think the $1.3 billion price tag is high. Motorcycles, while fun, are a much smaller market.